Rio Scafone who is set to rock out at Callahan’s Music Hall in Detroit on June 15th, as part of a double-bill concert, also featuring singer-songwriter Carolyn Striho and her band, will treat the audience (all of the reserved seating was sold out three weeks in advance, but general admission tickets were still available as we went to press) to her own brand of Rockabilly music. 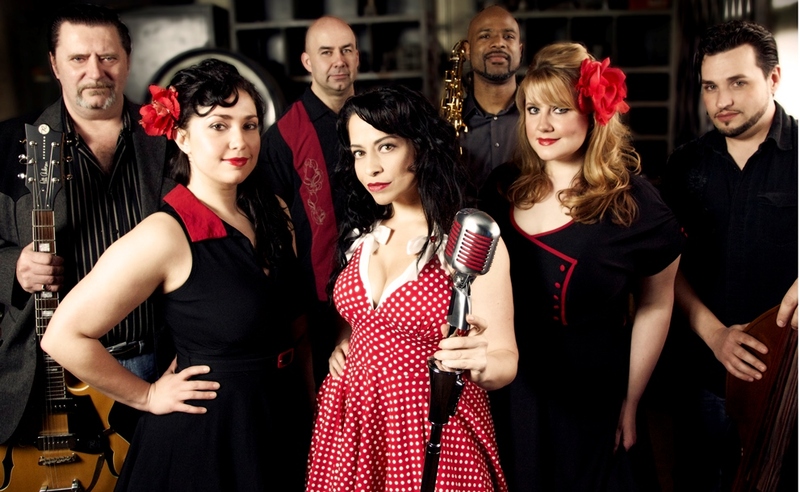 Her band Rio and the Rockabilly Revival have almost grown to legendary status for their high energy performances. It never ceases to amaze us how many truly gifted artists, whether they are singers, musicians, dancers, actors or whatever their craft happens to be, often receive their first inspiration as young children. Rio Scafone who is also a songwriter, as well as a television, film and theater actress has a story that is almost magical in nature and it begins when she was a small child growing up in Hazel Park, Michigan, a suburb of Detroit. It is a story so enchanting that we suggested to Ms. Scafone that she should seriously consider writing a children’s book about her experiences as a child. Young girls still need to be able to have their dreams of what one day might be. Urban legend has it that as a very young child Rio Scafone organized other children into putting on performances. Knowing how these stories tend to become exaggerated over the years and their retelling we were somewhat hesitant to venture down this line of conversation, but boy were we in for a surprise! (She starts to laugh) “Yes it is very, very true (she is laughing louder now) Oh my goodness. I, from a very young age was performing and I believed that everyone else should be too. The earliest stories that I have been told by my parents was at age six I was strong arming the neighborhood children into pretending we were The Little Rascals. I would be outside conducting and interrupting and telling them what parts they would play. I was the director and the producer. I just grabbed anybody that I could and I dragged them into my productions on a daily basis. I have a lot of memories of doing stuff (she can hardly get the words out, because she is laughing). There are a lot of people who remember it to this day, ‘I remember growing up with you on this street. You used to make me sing songs and I didn’t know what I was doing, but I was afraid to say no, because you looked so serious about it.’ I meant business at a very young age apparently. With her extended family, Rio Scafone grew up surrounded by people in the music business, her Uncle Jack who changed his surname to Scott as a stage name is perhaps the best known. Jack Scott who was born in Windsor, Canada before his parents and family moved to Hazel Park, Michigan had two gold records and many would assert that he was one of the first, if not the first Rock ‘n’ roll star to emerge from Detroit. His first 45 released had two singles that charted high, something that was almost unheard of “Leroy,” went to # 11 and “One True Love,” went to # 3. Scott would go on to have three more top ten hits and in total eight of his songs would land in the top forty on the U.S. charts. “He (Uncle Jack Scott) was probably one of the founding influences musically and creatively in my life. As a child of course, I didn’t have any concept of who he was on a national scale, because to me he was just Uncle Jack. We always had music in the house. My Uncle Jack is just one of a huge family that had other members that were into music. My Uncle Jerry (Scafone, recorded under the name Scott) put out some records as well. He is my Uncle Jack’s younger brother. He only put out a couple of records. My aunts, my uncle’s two sisters, Linda and Laura also recorded as well and they had beautiful, beautiful voices and they went under the last name of Scott as well. At Christmastime and on holidays at my grandma’s house we had a big Italian dinner, we would inevitably end up in the basement with amps and mics fired up and sing. Everybody would take their turn on the mic and sing together. When I think about my life this was just in the tapestry of who I was for as early as I can remember. I would just look up to my uncle and he would have that big huge voice. He has always been such a kind hearted, sensitive man and he was my hero at a very young age. I was brought up on all of his music obviously. I just remember from a very young age understanding that music affected me on such a physical and emotional level and I was so in tune with it. I would listen to his songs and literally they would give me goosebumps. I would be so moved and he would tell a story with a simple lyric and that is what really hooked me, whether he was my uncle or not. My reaction to it was just who I was. By age five I could sing all of his material. I could sing it and I had it choreographed. I was driven to sing. It started me off on the right foot and of course I incorporated other artists too. My parents were big Johnny Cash fans as well, so Johnny Cash and my uncle were at the start of my musical adventures. From the get go it was just who I was (singing and acting). By age five, right around midnight every night, I would climb out of bed. I had a bedroom on the second floor of our home and I would drag my little rocking chair over to the window and I would open the window. Back then not many people used air conditioning. We are talking a while ago. It was a hot, muggy summer night and at midnight of course if I was lucky the temperatures were cooling down and I would sing out my window. I would sing to the German shepherd, my neighbor’s German shepherd, Rebel, in the next yard. I would sing for hours into the night. I would sing my Uncle Jack’s songs and I would sing Johnny Cash songs. I knew instinctively how to position myself in front of the window and in front of the screen. I knew how to project my voice in such a way to attain the sound that I was looking for. I would duplicate a reverb effect bouncing my voice off of the pavement and off of the neighbor’s house. I was so in tune with using my voice and getting the sound that I wanted and I would sing for hours. Neighbors who also had their windows open would hear this young little voice for hours serenading them into the night and nobody complained thankfully. I think they were used to it. From a young age, not only was I singing for the sheer joy of it, it was as if I was driven to do it. I remember feeling very connected and I remember feeling (that I was) tapping into this current that was on a soul level. I know it sounds really deep, but that’s what it was. It would bring me such joy and such a feeling of being alive that I remember it as early as age five. My mom would ask me ‘Do you ever get tired of singing?’ (I would say) no. Looking back on it and it is true to this day that it comes through me. It is just something that I am lucky enough to channel through me. With this particular band I released a really bare bones, off the cuff EP called The Midnight Rebel Sessions and that is where that title came from singing at midnight and singing to Rebel this dog. There are few people that know that,” she says. The show presented by Rio and the Rockabilly Revival is theatrical, it is well choreographed and it has splendid music. Rio Scafone says the show really reflects her career journey, as she blends her acting experience with music. She spent decades performing in musical theater. I got serious about musical theater in high school and right after high school I was offered scholarships to go to some colleges that were all about performing. I chose instead to move across the country and (eventually) move to California. I had done so much theater by the time I had graduated from high school that I really wanted to move in a new direction and to do on camera stuff. Back then California was all about film and New York was all about theater, so I moved to California and I was lucky enough to start working. I moved to Los Angeles with a boy, my boyfriend at the time and I was there for many, many years. I didn’t know anyone and we had nothing. Actually, let’s step back, we moved to Arizona first. I met and I fell in love with a young man here (in Detroit). He was going to school here, but he was from Arizona and it didn’t work out with him going to school, because he didn’t like the program and he asked me if I wanted to move to Arizona and we went. Arizona became my second home for probably five years and I loved it so much. I performed a lot there. I got an agent right away doing a lot of commercials and doing a lot of theater. From Arizona we moved to California and I just continued working. I was scrappy though. You have to remember back then things were a lot different. I didn’t have any connections and I brought with me that scrappy Italian, ‘I can just do this,’ and it never occurred to me that I couldn’t. That was never instilled in me as a child and that is just who you were. You did what you did best and I really wasn’t thinking in terms of I am moving to Los Angeles will I make it? Those kinds of thoughts never came into my mind and they still don’t until this day. I don’t operate like that. I just do what comes naturally to me. Pretty soon I was doing commercials. I was just the type that had nerve. I remember sitting on my living room floor in Arizona and calling the casting director of General Hospital and I pretended to be my own agent. I had no idea of what an agent would say and I never thought I would get through to the head of casting for General Hospital. I remember thinking I can do this, I can do that. I called and somehow I was patched through to Marvin Paige (Casting Director General Hospital, 1980 – 2006), the head of casting at ABC for a while and I talked him into seeing this young actor, Rio Scafone when she came to California. He took a meeting with me (she laughs) and he booked me on a couple of days for General Hospital. I was always doing stuff like that. Fast forward many years later and I have made a really good living as an actress, as well as a singer. People always think that you have to choose one or the other and for certain times in my life I have had to choose acting for a while over music. It is really difficult to do both at the same time, because it is a lot to handle. It is a full-time job with both of them. I have gone through phases where I have had to step back from my music for a while and to focus on my acting. I have done a ton of (acting) commercials and feature films. I have just spent my life fluctuating from acting to music and a couple of years ago I decided to take a step back from acting, because I missed my music so much. I am so glad that I did, because here I am. Rio Scafone says that she made Rockabilly part of the name of her band, as it reflects the genre in its broadest sense. She says that Rockabilly really incorporates Gospel, Jump Blues and Hillybilly Rock ‘n’ Roll. By making Rockabilly part of the name for her band she says she is paying homage to all those genres of music. The Revival part of it she says is the feeling that the band gets and that they give in their show and she describes it as almost being like a church revival. “I have a wide demographic with my audiences. I have people from all walks of life coming (to my shows). I believe music is for everyone and nobody has a monopoly on the genre. To me it is all about the music. It (her vast demographic) is a total departure for anyone doing this genre of music. I do things my own way and I follow my gut. I have gotten a lot of flack from the Rockabilly scene in this part of the country. I can’t quite wrap my head around it and I have tried to understand it. I am much more in tune with my vibe and my natural showmanship is much different than most females and lead singers in the pure Rockabilly scene do. It is a vast departure. I meet a lot of very talented women who are doing straight Rockabilly. They will do the Patsy Cline and they will do more female songs from yesteryear. They tend not to be more willing to do some of the music that has a rougher tone. People have compared me to Little Richard, Elvis and Jerry Lee Lewis. I don’t stand there and sing the song, but I am all over the stage. It is not always pretty. I may start off in a pristine dress, looking every inch the pin-up June Cleaver type gal, but I end up just a complete mess and I leave it all on the stage. I have found that is a big departure from a lot of the more purist Rockabilly scenes and that is just who I am. A lot of reporters will report on how astonishing it is that my demographic is so broad and they will mention that, because it is a known fact a lot of the Rockabilly scenes don’t have that. The Psychabillies don’t rub shoulders with the Rockabilies and I didn’t even know they existed. It has been an education for me. While I sing this type of music, I do not subscribe to any subculture that alienates anyone else. My shows are for everyone. I do a lot of work for the community and I am a big believer in supporting gay and lesbian rights. I have done a lot of that and that is just who I am. I have to incorporate that into who I am as an artist. I am not about to change that to fit into any kind of subculture whatsoever,” she says. As for the music in her show, “We do a couple of my Uncle’s songs with his blessing. We do “Leroy,” and we do “The Way I Walk,” and our big show closer, which was one of his lesser known songs is called “Save My Soul,” and that sums up our whole show. People who come to our show now know and they come prepared to what they call testify. Our whole show is centered about the idea of sin and redemption. Our show starts off with audio of the Reverend Jimmie Snow from the 1950s preaching against the evils of this new sound called Rock ‘n’ Roll and we used actual audio from his sermon preaching that it is evil and that the evil is in the beat. He is an older man now, but he is alive today. He used to preach against the evils of this Rock ‘n’ Roll. When it first came out it was considered the devil’s work. My whole show starts with that and it takes them on a journey. Music is considered to be evil and especially this genre is so based on emotion. It is raw and it off the cuff. It has no pretense. It speaks to the human experience. They (the audience) know this and it is almost like a religious experience. We start the show with an audio clip from Reverend Jimmy Snow preaching against the evils of this new music called Rock 'n' Roll. He preaches against the evil you feel when you hear the beat of the music. We start the show off with that and then we take the audience on a journey from there. The themes of sin and redemption are woven through the show via the music. The music starts light and it grows darker as the show moves on. By the mid-point we do a cover of "Devil Inside," and everything gets darker from there until the final song "Save My Soul," which is at once a plea, a statement and it is symbolic of what music has done for me. People are on their feet and it is time to testify. They are on their feet, people from eighteen years old to eighty, as if they were at a church revival and they are singing “Save My Soul, Save My Soul.” It is about how we save each other, other people, just by being there. People cry. They are so in tune with it and it is almost like you are giving them permission to totally connect with each other and dance and just be free with it. It is so magical, it is absolutely magical. I always say I am going to put cameras on the stage to capture their faces, because my most rewarding moments as a performer have been performing that song at the end of our show when they are so with us. It feels so free and to help people to feel that way and to watch the joy on their faces as they let themselves go, it doesn’t get any better than that. It moves me to tears too and it takes me right back to being a kid. It is like I am sharing that with them. That is what our show is about. By the same token I feel that it is my duty and my honor to provide them with a show. I really respect my audiences. I think I learned that from a very young age and my uncle always did that too. I know they have a choice and they don’t have to be there. Times are tough. Going out for a night for people isn’t easy financially. This is their lives. They are giving up two hours of their lives to see me perform and you bet your bottom dollar that is never lost on me and I respect that. We work so hard to bring them an exceptional show that leaves them feeling better than when they walked in. At my shows I make it a point to meet people face to face. I think no matter what you do in life, that is what life is about. It is about the connection. I want to be able to set an example for my daughter. I am no different than anybody else. I am my brother and they are me. From a young age, I will tell you and I have never told another interviewer this before, when I was six years old and I was singing one night out my window…oh I get teary just thinking about it, because it is so visceral, I suddenly had the feeling and the knowing from every cell in my body and I heard it in my mind, you are connected to every other person on this earth. You are them. I was six years old. My parents were religious, but we didn’t have conversations. We went to church every Sunday, but this wasn’t coming from any kind of religious talk in my family. I remember that experience and it profoundly affected me. I remember it as if it was yesterday. That has been with me every day of my life. I try to live that way. Regardless of what I am doing and regardless of whether I am acting or I am grocery shopping or I am on stage, it doesn’t matter that truth is something that I know for me is profoundly a part of who I am. I take that into my performance and into my artistry and I think people sense that I honor that. I am thankful. I think that is why people enjoy our shows too. They feel welcome on a personal level. That is my goal. Every show that I do, everywhere that I perform it is with that intent,” says Rio Scafone and that is the essence of the artist and the person. Tickets for Rio and the Rockabilly Revival are available through www.ticketfly.com (June 15, 2013).